A new study out this week suggests that men who take high amounts of vitamin B6 or B12 supplements for a long period of time may increase their lung cancer risk about two-fold compared to men who don’t take these supplements. Risk increases even more among men who smoke. The study was published today in the Journal of Clinical Oncology. It adds to a body of research on supplements and cancer risk. 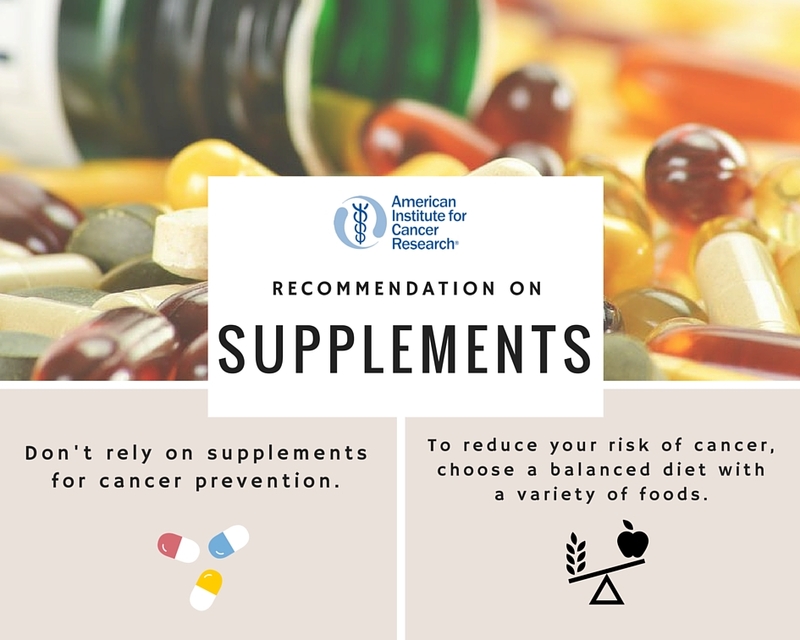 AICR analysis of the global evidence has led to recommending that you not rely on supplements for cancer protection. This study was a relatively large one. It included about 77,000 participants who were ages 50 to 76 at the start. Everyone reported the type and amount of supplements they were taking at the time they entered the study and the ten years prior. They also filled out questionnaires about their eating, smoking and other lifestyle habits. After an average of 6 years, 808 individuals had developed lung cancer. Taking vitamin B6 or B12 individually was associated with a 30% to 40% increase in lung cancer risk among men. The link was not found when taking the B supplements as part of multivitamins. There was no link to lung cancer risk among women who took supplements. Among men who smoked, taking more than 20 milligrams of B6 every day for a decade were almost three times more likely to develop lung cancer compared to non-supplement users. Taking more than 55 micrograms of B12 over the ten years linked to about four times the risk of developing the cancer. This was after adjusting for other lifestyle factors, such as alcohol use and weight. The amount of recommended vitamin B that you need depends on your age. Among adults in this age group, 51 and over, the National Institutes of Health recommends men get 1.7 milligrams a day and women 1.5 milligrams a day of vitamin B6. For vitamin B12 the recommended amount is 2.4 micrograms a day for adults. This isn’t the first time supplements have linked to higher cancer risk. A big analysis of the research a few years ago by the U.S. Preventive Services Task Force found beta-carotene supplements increase the risk for lung cancer in smokers. There are many reasons why you may want to take supplements of course. But for cancer prevention, AICR recommends getting your vitamins and other nutrients through food. Spinach, dark leafy greens and fish are packed with B vitamins, for example. And foods will give you a variety of nutrients and phytochemicals that work together for good health – and cancer protection. The JCO study was supported by the National Institutes of Health, the National Cancer Institute and the Office of Dietary Supplements.